The numbered is on a mission to help your little one explore the world of numbers and mathematics. 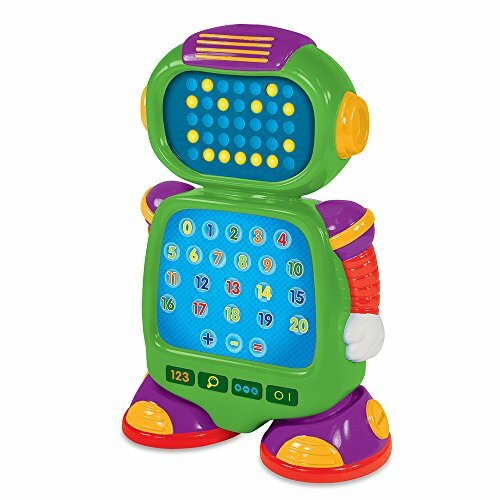 This robot friend features a colorful touch pad sensor panel, interactive LED face and three game modes. Learn the numbers, find it and mathematics quiz are the games that will have your child turning into a real problem solver. With numbered your child will have a great start to their education. Requires three “AA” batteries (included). ages 3+ years. Develop mathematical ability - with three game modes to challenge your child's mathematical ability and help teach new math skills, the numbered is the perfect interactive friend to help boost math skills. Encourage development of listening skills - children are encouraged to listen carefully to instructions and follow them correctly to complete each challenge. This is a great way to increase their ability to listen and follow guidance, all while having fun. Build confidence - completing a challenge, either together with an adult or independently, gives a child a sense of achievement that provides them with a healthy boost to their self-esteem. Learning new skills is a great way to increase a child's sense of self-esteem. Boost problem-solving abilities - working out the correct answer to input into the numbered makes use of your child's developing problem-solving skills and encourages them to think creatively. Help develop fine motor skills - inputting answers and using the touchpad sensor panel is a good way to gently exercise your child's fine motor skills - once they have found a correct answer they are going to want to make sure they input it correctly! If you have any questions about this product by The Learning Journey, contact us by completing and submitting the form below. If you are looking for a specif part number, please include it with your message.